Sure, it makes a tasty cocktail, but the puro New Mexico Bloody Maria mix elevates a number of recipes. Above: Bloody Maria. Photograph by Douglas Merriam. 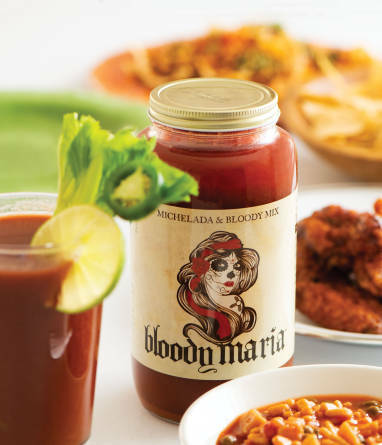 Bloody Maria chicken cacciatore is just one of the recipes in the free, downloadable cookbook dedicated to Bloody Maria mix, the New Mexican–made, green-chile-infused product that’s good on pretty much anything. When Malisa and Marcos Aragon, who live in Pilar, introduced their product four years ago, they realized they had more than just Bloody Mary juice on their hands. Though it’s definitely good for that, too. Add two ounces of vodka (for a Bloody Mary) or two ounces of tequila (for a Bloody Maria) to four ounces of the mix for a fantastic cocktail. If you’re more of a beer drinker, add an ounce and a half to a Nuevo beer, the cerveza clara that’s a partnership between the couple and Santa Fe Brewery, for a New Mexico–style michelada. The Aragons are also part owners of Tim’s Stray Dog Cantina, at Taos Ski Valley, where the sporty cocktails match picante meals. A 32-ounce jar of Bloody Maria mix goes for $10 at most specialty liquor stores in New Mexico, like Susan’s or Owl’s, in Santa Fe.